The best known example of the cab-forward design in the United States, the Southern Pacific Cab-Forward (also known to a lesser extent as “Cab-in-fronts” and “Cab-aheads”) placed the cab at the front by the simple expedient of turning the entire locomotive, minus the tender, by 180 degrees, an arrangement made possible by burning fuel oil instead of coal. 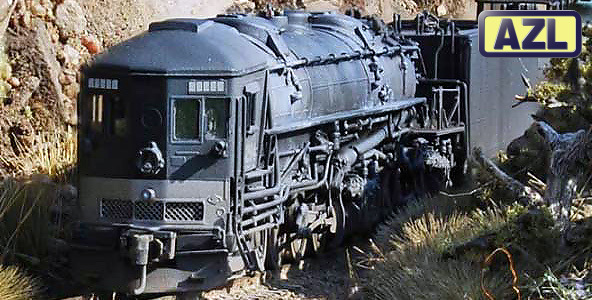 The cab forward design was widely used by the Southern Pacific Railroad, which developed it to deal with the peculiar problems of its routes. The 39 long tunnels and nearly 40 miles (64 km) of snow sheds of the Sierra Nevada Mountains could funnel dangerous exhaust fumes back into the crew compartment of a conventional locomotive. After a number of crews nearly asphyxiated, someone had the idea of running his locomotive in reverse. This meant that the tender was leading the train, which introduced new problems. The tender blocked the view ahead and put crewmen on the wrong sides of the cab for seeing signals. The tenders were not designed to be pushed at the lead of the train, which limited speeds. Southern Pacific commissioned Baldwin Locomotive Works to build a prototype cab-forward locomotive, then ordered more before the prototype had even arrived.